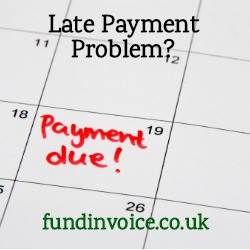 Battling with a late payment problem? You might feel like you are all alone by recent research from Close Brothers Invoice Finance suggests that is not the case. It suggests that many other UK SMEs are being affected by slow payments, and this has been highlighted by several sources of independent research. Their poll found that 42.8% of SMEs say that late payments are a problem for their business, and their poll found that the "Wholesale and Distribution" sector was particularly affected with 54.1% of SMEs within that sector saying the same. This is not the only piece of research revealing the extent of the problem within the UK, a previous one of my blog posts cited research conducted by Dun & Bradstreet showing similar figures (48% of SMEs impacted by late payments). In that post I went on to give some examples of actions that you might take to help solve the problem of late payments. The potential solutions included tightening up credit control procedures, considering using an outsourced service, or accessing gap funding to bridge the period between completing work and getting paid. FundInvoice found similar issues in our survey of recruitment companies within East Sussex and Kent. Our survey identified 52% of recruiters wanting to see an improvement in late payments from customers. So it appears to be a business affecting SMEs across a variety of sectors within the UK. There is an entire industry of receivables funding companies that have developed to help companies bridge this cash flow gap between delivering work and receiving the money for the job. They can cater for all business sectors from manufacturing, wholesale and distribution, recruitment through to construction and retail. There are a variety of gap funding solutions that can be established to smooth your cash flow. These solutions work by releasing part of the value of your sales immediately your produce the invoices (or applications for payment in the construction sector), and then the balance when the customer finally pays (less the fees for using the service). Our guide to receivables funding may be worth a read if you are experiencing late payment problems.